Who doesna��t love the monsoons?a�� Days spent with faces turned upwards, watching black and blue clouds chasing across the sky and the unexpected hush that falls before the storm strikes, a cue to sip hot tea and sample home-made savouries. With Kerala, Maharashtra, coastal Karnataka, Goa and Gujarat getting their fair share of showers, we are nearing the fag end of the South-West monsoons a��here are some of the old, picturesque home-stays in the country where you can enjoy the last few days of the monsoon. If youa��re looking for a quiet place soaked in petrichor, head to the 400-year-old Kuruvinakunnel Tharavadu in Kottayam. 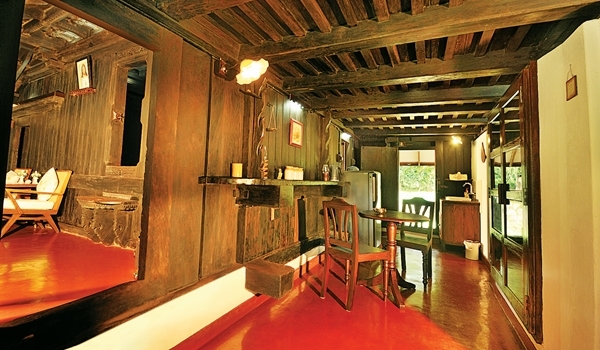 Sandwiched between a 15-acre estate (comprising coconut groves) and the river Meenachil, the tharavadu (bungalow) is one of the last standing houses that has the litho plan British architectural style of tiled roofs and wooden walls. The house, has two bedrooms which sport antique 400 – year old furniture and old world lanterns. Guests can also explore the kitchen, decked with urlies of pickles that has a passage right down to the nilavara (traditional storage rooms)which stock yams and coconuts or discover the cellars that were the hiding place for women during attacks from robbers. Louis Kuruvilla, the owner, tells us that guests spend their time taking short bike rides across the dirt lanes of the estate or eating the home-cooked food prepared by his wife, Clary, from her vegetable garden. Her monsoon specialties include Palappam and vegetable/ meat stew, piping banana fritters, fried beef and fish fry. a�?Most of our guests spend their day reading books, sipping pepper tea and enjoying the raindrops from our courtyard because youa��re in sync with nature,a�?ClaryA� smiles. A regular haunt of visitors who come to Goa for the San Jao FeastA� that kick-starts Goan monsoons, is the colonial 200 – year -A� old home stay Arco Iris situated in Curtorim Translating to a�?Rainbowa�? in Portuguese, the house is built on a terraced, 1.5 acre property, its frontweighed down by Gulmohar trees and overlooking a paddy field with a seasonal lake that swells only during monsoons. The river Zuari, famous for boat safaris and rafting is also visible from the home. Hosting fiveA�A�A� bedrooms with Portuguese style four posters each sporting the colour of a rainbow, come with an attached balcao (balconies) where one can watch the rain and have meals overlooking the fields. a�?During monsoons, we host a lot more Indian visitors who come here for white water rafting, and treks and hikes to the springs and waterfalls that dot Margao region.We also have an option of setting up a camp fire by the lake, when the rain abates and Goa is at her green rain-dressed best,a�? says Bennita, the owner. Her monsoon specialities are pomfret with recheado masala, prawn rawa fry and chicken cafreal served with a selection of hot vegetable and meat soups. Price: Rs 5,000 per night. For those of you who want to travel back in time to the glory of ancient India, there is nothing quite like the House of MG, situated in the heart of Ahmedabad. It was once the residence of Mangaldas Girdhardas, Ahmedabada��s prominent businessman in the 20th century. However, it still retains its old charm with high ceilings, mosaic floors, and stained glass windows. a�?The open air restaurants and the serene atmosphere is what makes this place unique. During the monsoon, you get to enjoy the cool breeze in our beautifully lit gardens and terraces. We also have a mega screen projection for the movie buffs,a�? says Abhay Mangaldas, owner, House of MG. It includes 38 rooms, two restaurants, a gift shop, salon, spa and art book store among other facilities. With a rooftop garden and jhoolas (swings) in the rooms, this is the place if youa��re someone who likes to laze around on a rainy day. Whata��s more, you also get to indulge in authentic Gujarati snacks such as chaat, batakavada, patra and panaki, served hotA� to complete the monsoon experience. Price for one night Rs 7,000. Nestled in the hills of Chikmagalur, Karnataka, Honeyvale Homestay is home to a range of exotic flora and fauna.A� Established in 1890, this 200-acre estate includes a bungalow and a duplex cottage. What makes this place stand out during the monsoon are its exciting activities. a�?As most outdoor activities are difficult during the monsoon, we have a bonfire in the evening and karaoke as well. About 10 kilometres away, you get to experience white water rafting. The river flows only during the monsoon. We also have a 30-foot tree house for those who want to enjoy the tropical weather at its best,a�? says BSV Rao, owner. a�?Also, being a coffee state, we provide our customers complimentary coffee throughout the day and a barbecue at night, a perfect companion for the monsoon. Our prices are inclusive of all meals and snacks,a�? he adds. Price: Rs 2,800 per night.